Traveling – be it domestic or international – is currently on the upswing mainly due to the way businesses are becoming more globally competitive. And of course, more people are getting to appreciate different cultures and want to experience it for themselves. Today, the travel and tourism industry is one of the largest and fastest-growing industries in the world, with estimated annual contributions of over $7 trillion worldwide. The advancement in technology led to the development and vast growth of tourism. Building a travel website is an enticing option for those who are looking to generate revenue online. Whether it’s a travel blog to share your adventures or a hotel website for accommodating guests, the options are limitless and it only takes a professional and feature-packed WordPress theme to help you become the next big thing. Sure, there’s a wide range of themes out there that are tailored for travel blogs and tourism agencies but the choices get narrowed down further if you need both form and function. One such theme that meets the specific needs of travel-related sites is the Love Travel – Creative Travel Agency WordPress theme. Love Travel is a beautiful theme for travel blogs and websites. It’s one of the top-sellers in the ThemeForest marketplace – and for a good reason! This Love –Travel Creative Travel Agency WordPress in-depth review will give you plenty of reasons to choose this theme to log your own adventures or to provide services to those who want to satisfy their wanderlust. Love Travel – Creative Travel Agency WordPress is a top-rated Theme Forest theme created by a two-man team of web developers called nicdark. The theme was the result of several months of hard work, analysis, constant enhancements, and guaranteed quality. As the name implies, it’s a creative theme with flexible design options that allow you to create and add various types of functionalities for your travel site. Besides, with a lot of customization options to play around with, you can run an online shop and multi-lingual version quickly and easily with this theme, too. What’s more, apart from being fully responsive (which is a standard feature among themes these days), Love Travel also boasts parallax features, video sections, mega menu, fancy box images, and a whole lot more besides. So if you want to build a tour/travel site and want to get your business online, Love Travel is your top choice for promoting your services. Nicdark also made sure to provide documentation and quality video tutorials that will help you save a lot of time. What’s more, they decided to provide free theme support, ensuring they have all the help they need in case they encounter issues with the theme. The Love Travel – Creative Travel Agency WordPress theme has a modern and minimalistic design that highlights the most important aspect of your site: Your products and/or services. It’s a multi-page premium WordPress theme that’s designed with travel agencies, tour firms, and travel blogs in mind. But thanks to the simple, creative, and clean graphics, the theme is also an ideal solution for any other type of website. Love Travel was designed using a 1200px grid system, with up to 12 columns. It comes with pre-built page layouts, including ones for Destinations, Markets, Staff, FAQ, Prices, etc. You also have the option to add a shop to your website, complete with a shopping cart, checkout, My Account section, as well as products layout (full width, right sidebar or left sidebar). To further customize your pages, the theme also includes over 100 components to further expand your site’s functionality, including mega menu, countdown page, Under Construction page with rain effect, Search Travel filter, accordions, price table, and a whole lot more besides. Now, you have complete control over every aspect of your site! Love Travel is fully responsive, so rest assured that your customers and site visitors can see your content the best way possible in all modern devices. The theme uses a grid system that fits your content in a simple and uniform way. The theme is optimized for devices with retina display as it uses retina-ready font icons by hybrid design and front-end developer, Alessio Atzeni. These icons are easy to use and integrate into the theme, so you can create a unique and modern look for your site. Love Travel uses the popular 12-column grid system. All the grids can be used for any shortcode so it’s easy for you to customize the theme in any way you like. With demo content included in the theme, you can easily create a full-blown website in just minutes. You can import content for the whole site (XML) in the import theme options. The theme comes packed with a jQuery UI library that allows you to add dynamic effects to your site, including accordion, tooltips, progress bar, parallax effects, and more. All of these effects are easy to add by entering the relevant class. 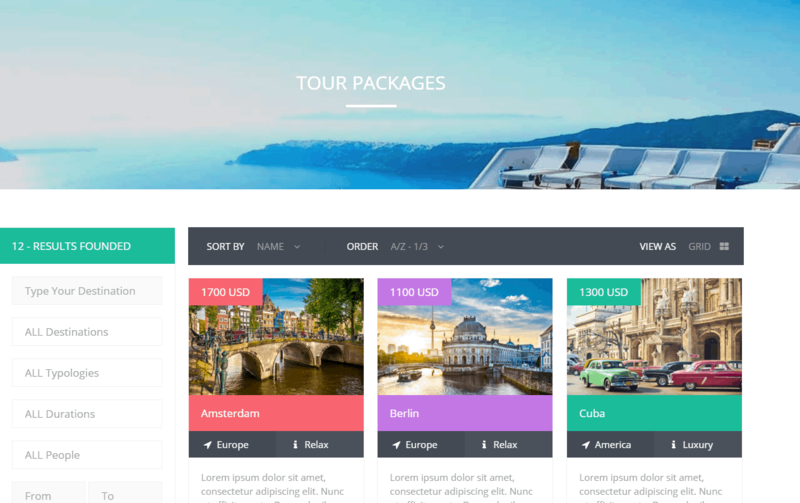 With a custom filtering system, users can easily search for tour packages in your site. The filter option allows users to search by price, type, season, destination, and duration of the trip. You can also insert information in the taxonomies in order to further customize the filter. The theme comes with two menu options for managing your content the best way possible. You can customize the fonts and colors, and choose between standard and sticky (fixed) for the main menu. You can also add a sidebar for showcasing your latest offers and promotions, or the top destinations. 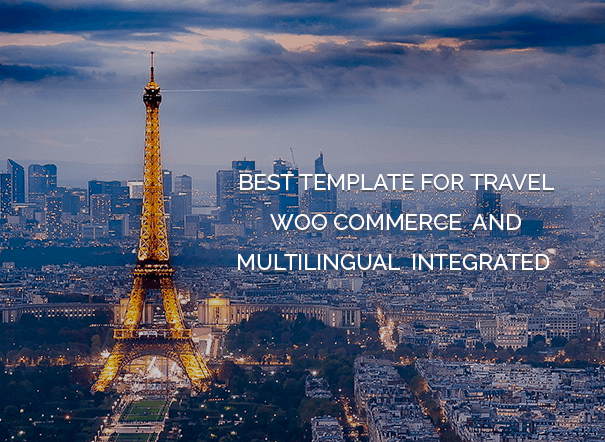 Love Travel is integrated with the popular WooCommerce and WPML plugins. 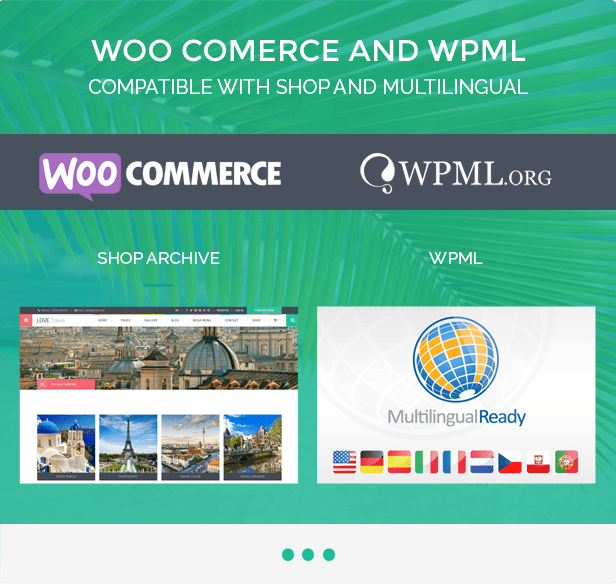 With these premium add-ons at your disposal, you can easily add an eCommerce functionality to your site and make your site translation ready so you can cater to a global audience. Love Travel comes packed with premium plugins, including Revolution Slider – saving you up to $19. With this plugin, you can create beautiful slideshows to display your offers and the top tourist destinations. The plugin supports HTML5 videos, Vimeo, and YouTube, allowing you to easily add videos to your site. You can also insert images in the slideshow to add a colorful and creative appeal to your site. Contact Form 7 is the best WordPress plugin for creating a contact form. With this plugin, making your own form for travel booking and newsletters is a breeze. To make the graphics even more dynamic, make sure to use the retina icons and the various color options. Love Travel is updated more often than its free counterparts. This is an important factor in choosing a theme, given the fact that WordPress is constantly updated. A theme that’s regularly updated patches the latest bugs and security issues before it can cause any problems to a site. Free WordPress themes are widely used that it’s not uncommon for many websites to use the same design. With premium themes, there are more features and customization options that allow you to create a unique design that will stand out from the rest. Love Travel is well documented and included a detailed PDF that explains how you can get the most out of it. On the contrary, documentation is less common among free themes. Unlike many free themes that require an attribution link to be included in the footer, premium themes like Love Travel don’t require users to add a link to credit the theme author, giving your site a more personal appeal. Premium themes obviously come at a price, requiring you to invest anywhere between $30 and $300. Because premium themes have their own custom admin panel and a variety of features and options, it might take a while to learn and set up. Some premium themes tend to include lots of bells and whistles into the package which other users might find unnecessary. While this makes a theme versatile, the unwanted features will just bloat the theme. Generally, the most important thing to look for in a WordPress theme – be it free or paid – is the quality and care that’s gone into creating it. The easiest way to gauge a theme’s quality is to read what the customers are saying in support forums, including the issues users are having with the theme. It’s also important to know how prompt and responsive the theme authors are at addressing the issues. True to its name, the Love Travel – Creative Travel Agency WordPress theme is a theme all travel bloggers and business owners will love. 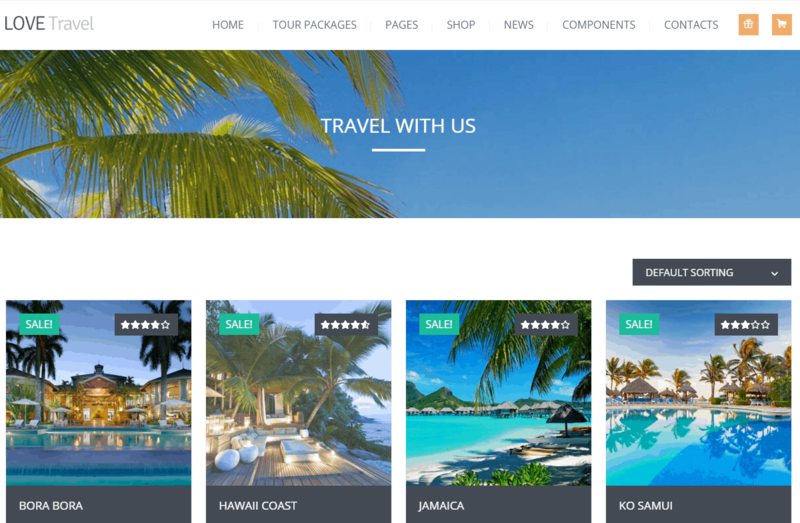 It’s a creative, professional, and well-coded premium theme that’s not just for travel agencies but for any kind of business niche. It’s simple, clean, and modern, with lots of useful features to help you become the next big thing in your chosen niche. It’s affordable and reliable, making it one of the top choices in the ThemeForest marketplace.